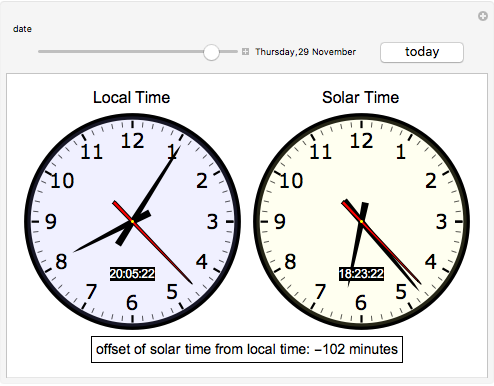 This Demonstration shows two clocks that compare the current local time with the apparent solar time at the user's location. Solar time differs from clock time due to the equation of time for the date and the offset of the user's location from the center of the location's time zone. The use of daylight saving time will further increase the difference by 60 minutes. Click the "today" button to set the solar time for today, which takes into account the user's location, time zone, and daylight saving time when appropriate. 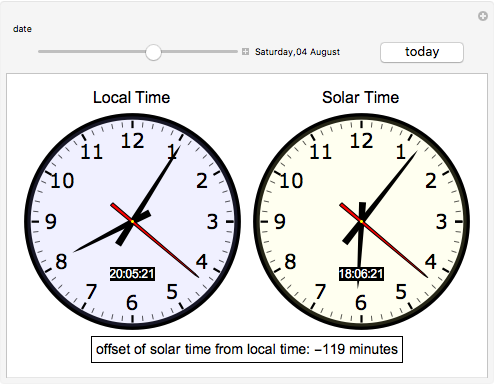 Changing the date shows the variation of solar time at the user's location during the course of one year. The clock graphics code was adapted from Christopher Carlson's "Always the Right Time for Mathematica..." post on the Wolfram Blog. 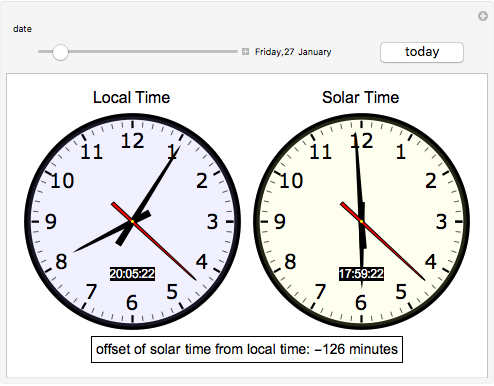 Erik Mahieu "Solar Time Calculator"